On Sunday January 13, 2019 in Los Angeles, Caleb Plant, now 18-0, 10 KOs, won the IBF super-middleweight championship with a unanimous 12-round decision over Jose Uzcategui. Judges had it 116-110 twice, and 115-111. Many are high on the performance, but yours truly saw two different fights – the first half, in which Plant boxed effectively, using lightning-fast hands, subtle footwork, quick leads and beautiful counters, and the second half, in which he went into survival mode to freeze the ball, so to speak, holding a lot and not throwing very often. Fortunately for Plant, he scored flash knockdowns with counter left hooks in both the 2nd and 4th rounds, and outboxed Uzcategui in the 1st and 5th rounds as well. However, starting in the 6th round and continuing for the rest of the fight, Plant was much less active or effective, throwing and landing less often, and he held, smothered, covered, and leaned in a lot more. He seemed tired and content to sit on his lead. His speed, footwork, and clinching ability helped him (as well as the referee’s refusal to break them very often or issue cautions for holding). Uzcategui was a bit more active and aggressive, and landed more often and more cleanly, on my card eeking every round of the second half of the fight (I gave him the 3rd, and rounds 6-12 – for 114-112 Uzcategui), but quite frankly, even when Uzcategui was winning the rounds in the second half of the fight, he seemed to lack sufficient passion, and several of the rounds that I thought he won were at least close or semi-even, and when they are close, you give the judges a chance to throw those rounds Plant’s way. 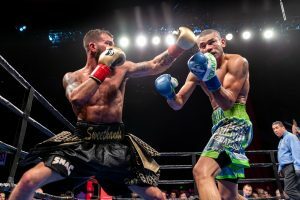 Despite that fact that Uzcategui was more effective, active, and aggressive overall in the second half of the fight, his overall lack of pace and sufficient aggressive ferocity, often remaining too far away for too long, and not moving in enough, or going to the body enough, and failing to maintain a faster pace, allowed and helped Plant survive. Uzcategui failed to capitalize sufficiently on what appeared to be an opportunity to dominate a tired foe. Quite frankly, Uzcategui’s semi-lackluster though more aggressive and diligent effort made Plant’s performance look better than it really was. And Plant looked quite vulnerable to a more willing foe. It is quite possible that Plant’s quick counters that decked Uzcategui early on had garnered him so much respect that Uzcategui simply was unwilling to take the chances he really needed in order to dominate late. Only Uzcategui really knows. But to call Plant’s performance brilliant would be to overstate the truth. It was what it was. Reasonable minds might even question whether he won. But that isn’t and won’t be the popular take on this one. In other action, in what on paper appeared to be a step-up fight for Brandon Figueroa, his fight against Moises Flores turned out to be an easy dominant performance. Figueroa was too strong and relentless, peppering the body and head consistently in relaxed fashion, both inside and out, leading to a 3rd round knockout. Flores was too passive, and his defense not good enough. He seemed to be overwhelmed. A left hook in the 3rd decked Flores for the first time, and a right hook dropped him again, leading to the stoppage. Guillermo Rigondeaux did what he was supposed to do in what was an utter mismatch in its inception against Giovanni Delgado; knocked him out in the 1st round. Delgado, who was coming off several stoppage losses, was hurt by a body shot, and then Rigo finished him off with a straight left. Delgado was just a body to perform upon for a brief period of time. Enough said. Joey Spencer was equally overmatched against Brandon Harder, who did not belong in the ring with him; the talent disparity being all too evident from the start. Harder went down at the end of the 1st, and a couple times in the 2nd, and the referee had to stop it, lest it become too farcical. Ahmed Elbiali was sharp, aggressive, and strong in dominating Allan Green, who simply is too old and shot at this point in his career to be anything more than a human punching bag against a fighter of this level. Green was game and tried his best, taking the heavy blows, covering, firing some hard jabs and hooks, but mostly he was pounded upon with vicious rights, hooks and uppercuts, going down in each of the 3 rounds it lasted before the referee finally mercifully stopped the slaughter. It is sad, in a way, because at one point in his career he would have given Elbiali hell, but those days are long gone. Green should consider retirement. Ryan “Cowboy” Karl avenged his prior defeat to Kevin Watts, scoring a 5th round TKO this time, in an entertaining contest. They went at it, bombs away in the 1st, with Watts having the edge, landing more, particularly to the body. However, from the 2nd round on, Karl was more active and effective, and started gradually taking over. Watts was very game, firing and occasionally landing some hard blows, but overall he was too defensive and getting outworked by Karl’s incessant non-stop power punches. By the 5th round, Karl was dishing out the punishment, and the referee stopped it with Watts covering up on the ropes, though quite frankly, Watts was not particularly hurt or even wobbly, and probably still had something to offer. Lindolfo Delgado was too strong and talented for Sergio Lopez, overwhelming and stopping Lopez with a body shot near the end of the 3rd round. Fernando Garcia got a real test against Isao Carranza, who was tough as nails and much better than his record would indicate. Garcia clearly had the superior talent and skill, landing the crisper, sharper blows. But Carranza had one heck of a good chin, and was very game and tough, firing back quite often, even landing some nice punches, often counters. Garcia occasionally had a look of, “Wow, I can’t believe this guy is hitting me back! How did he take that?” The referee stopped it in the 6th round, when Carranza was wilting a bit and getting hit a lot, but quite frankly, he wasn’t wobbly; just taking too many. He probably would have lasted the 6-round distance had it been allowed to continue. Ruben Rodriguez pounded away on Daniel Perales, leading to the 3rd round TKO. A brutal headbutt suffered by Angel Monrreal in the 1st round of his contest against Victor Slvansky forced a technical draw. And when I say brutal, I mean B-R-U-T-A-L. It was so loud that the explosive cracking sound could be heard throughout the arena. Why in the world do they call these accidental foul stoppages technical draws? It should be called a no decision. Calling it a draw implies it was some sort of even fight, which it rarely is. Michael Plania won an 8-round unanimous decision (79-73, 77-75, 78-74) over Juan Lopez. Plania was faster and flashier with his combinations, while the much slower Lopez was a bit stronger, sturdier, and consistent, enough to make it close. Plania scored what appeared to be a knockout in the 1st round with a body blow, but the referee for some reason decided it was low.